The Sport Rider 3-wheel scooter from Pride® combines power, comfort, and style. 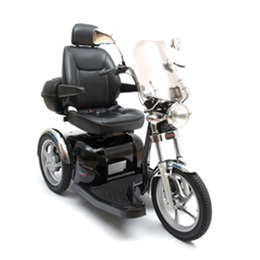 The Sport Rider has a complete list of standard features including a fully digital displaying speedometer and odometer, a full suspension system, a high-back adjustable seat, two rearview mirrors, and a powerful front and rear lighting kit. With speeds up to 9.4 mph and a maximum weight capacity of 400 lbs., the Sport Rider has a sleek, sporty look without sacrificing high performance. Tire Dimensions: 2.75" x 14"